Soundwave, Blaster and their cassettes were one of the most memorable, unique things about Transformers in the 1980s. Before Michael Bay and his series of films brought the franchise back to the popular consciousness, if you'd asked anyone who was a child in the 1980s what they remembered about Transformers, you could be all but certain they'd name a few things: Optimus and Megatron, the Dinobots, and "the tape player guy". In spite of that, and in spite of the fact that Soundwave the character has been a frequent fixture in various series since he reappeared with 2005's Cybertron figure, the one thing that made Soundwave truly memorable -- his huge army of varied minions -- has never been revisited until now. A Voyager-class Soundwave was released as part of the Fall of Cybertron line, and following Hasbro's standard operating procedure these days was immediately repainted into both Blaster and Soundblaster. Designed to go with these bigger "tape player" figures was a sub-line of Legends figures, sold in two-packs just like the original Mini-Cassettes were back in the 80s. Though they haven't released a complete lineup, we've gotten as close to one as we've seen since the 80s: in addition to Laserbeak, Buzzsaw and Steeljaw (pack-ins with Soundwave, Soundblaster and Blaster respectively) they've also made two-packs of Rumble/Ravage, Ramhorn/Eject, Rewind/Sunder and the duo I'll be reviewing today: Frenzy/Ratbat. I'll be the first to admit that I wasn't sold on the whole "data disc" idea to start with. Taking a group of characters whose main identifying feature was that they turned into boxes and making new versions that now turn into circles may not seem like too much of a departure, but the cassettes' robot modes were so blocky and squared-off that it's practically their signature. How (or even if) the designers would manage to capture that feeling was something I was very leery about, and as it turns out with good reason. Alternate Mode: There's very little to say about these two in their alt-modes, which as I said before are little more than big, fat circles of plastic. Ratbat is pink, while Frenzy (since Hasbro flipped the switch from "toy schemes" to "cartoon schemes" a few years back) is red. 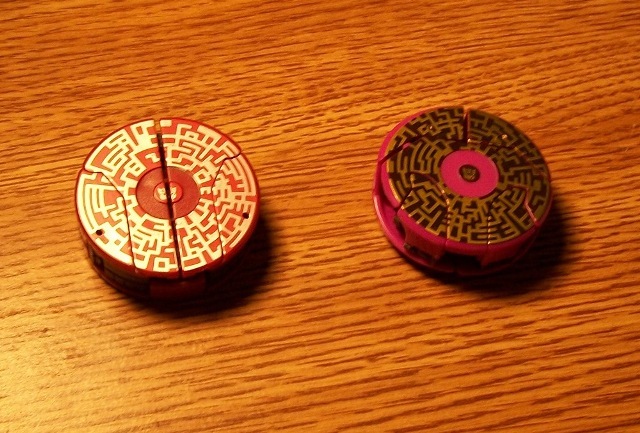 Both have a colourful circuit pattern painted onto the top side of the disc, with small Decepticon logos painted in the middle. They don't really do anything, and honestly, compared to the 80s cassette tapes they're pretty boring. I suppose that's the difference between a real-world alt-mode and a made up one. Robot Mode: Ratbat is instantly recognizable as who he's meant to be -- a pink bat with a huge wingspan and some black and gold details in the right place. 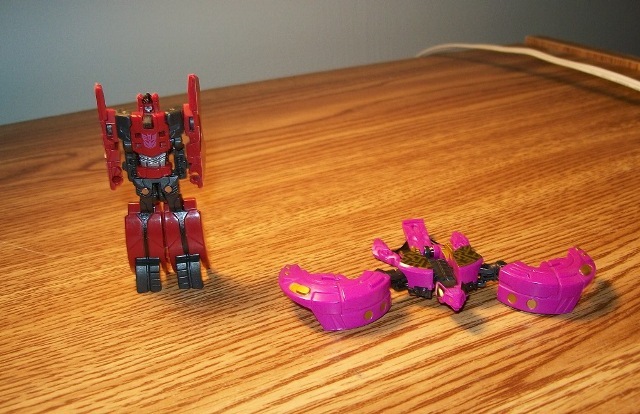 As a huge fan of all things Ratbat, I think he's as good as physically possible for a Ratbat who turns into a disc. His head sculpt owes more to his comic portrayal than the original toy, and sculpted in plastic it makes him look more adorable than threatening. The tiny Decepticon symbol painted on his head (which is hard to spot both in pictures and in real life) only adds to the cuteness. But then, FoC Ratbat is an accountant who spends his time tricking the Autobots with Ponzi schemes, so he really doesn't need to be a threat. Frenzy, on the other hand, doesn't come off so well. The colours are right if you're trying to replicate...well, whichever one you think the red tape should be. But the layout of those colours, the deco pattern and the molding are all wrong, to the point where you'd have no idea who this toy was supposed to be if you didn't know it was meant to go with a modern Soundwave. While Ratbat dodged the alt-mode shape issue pretty artfully, Frenzy couldn't escape it and the physical realities of making a robot out of a hockey puck meant that the toy's silhouette is absolutely nothing like the guy it's meant to look like. On top of that, the robot's colour layout is backwards so instead of getting a robot that's mostly black with red highlights we got one who's mostly red with black highlights -- more Enemy than Frenzy. Neither robot has very good articulation, either. Because they have spring-loaded transformations (more on that later) they have lots of joints, but the springs inside them force the toys to pop back into a "default" position unless you're putting pressure on them. With Ratbat it's not much of a problem, because 99% of fans are going to want to pose him or the condor-tapes (with whom he shares a basic design but almost no parts) perching on someone's shoulder or swooping down at unsuspecting prey, and he can pull that off. But Frenzy is a humanoid robot, and you'd expect him to have at least as much play value as a modern Legion-class figure since they're about the same size. And he just doesn't. His shoulder swivels are the only joints that aren't spring-loaded, and his hips can't move forward at all. His hips are jointed to do the splits, and his spring-loaded knees mean that he can deliver a wicked kick to anyone who's already down on the ground, but as soon as you put the toy down those joints pop back to their default positions again and he's left standing at attention. Although they're sold as stand-alone toys, these guys really aren't all that good as stand-alone toys. They're designed to work with a larger tape-player figure, and if you don't have one these guys really aren't worth getting. As Accessories: But what about with a tape-player? In that context they continue the trend that they set in robot mode. Ratbat fits nicely inside my Soundblaster's chest, and when ejected from the larger Decepticon he shoots out and lands with a great deal of force -- enough force to push a button on the underside of his disc mode, triggering his transformation. When that happens, the springs inside Ratbat jump into action and he hops up into the air, unfolds neatly and lands back on the ground in bat mode. It works very smoothly, and is a simple joy for me to watch -- an example of a reimagined gimmick working almost perfectly, and creating something that I'm sure small children would love the heck out of. Frenzy, unfortunately, not so much. 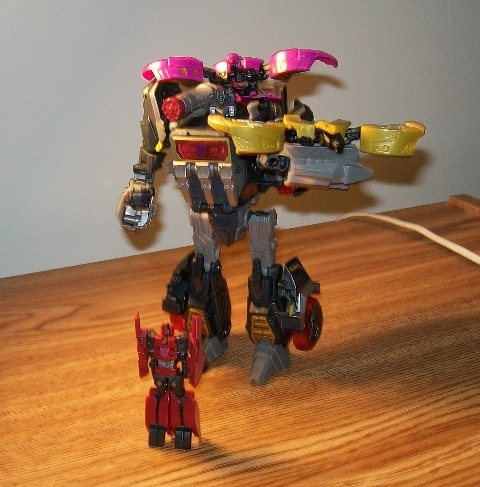 While Ratbat fits smoothly inside Soundblaster's chest, Frenzy does not. He requires a bit more force to get in or out, so he doesn't eject with as much pop as Ratbat. That means that he doesn't shoot out so much as flop out, and doesn't always land flush on his transformation trigger. Sometimes his transformation doesn't trigger at all, and sometimes when it does one of his internal catches won't release, preventing him from fully transforming. On the occasions when it does work Frenzy winds up on his belly in robot mode, with his toes still folded in and his hands above his head in an "I surrender!" pose. I understand that it's probably impossible for him to wind up on his feet at the end of the auto-transform, but after seeing how well-executed the concept was with Ratbat, Frenzy is just a disappointment.